What are values of pineapple? When is the right time to harvest pineapples? It depends on the uses, fresh-eating or processing? Near selling or exporting? 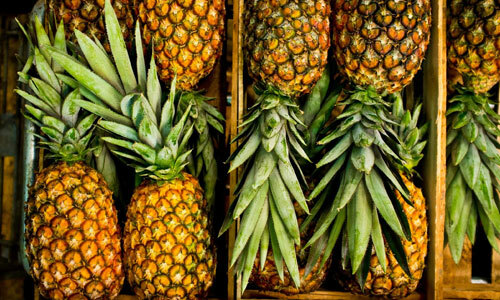 In general, when 1/2 small fruit turn yellow, the pineapples are suitable for near selling; when 1/4 small fruit turn yellow or small fruits are grass green, the pineapples are suitable for processing or exporting. Pineapple can be used as fresh food. The pineapple fresh fruit can also be quick-frozen, after washing, peeling, coring and cutting, then -35 ℃ freezing treatment and storing at -20 ℃ low temperature, the nourishment is the same as fresh pineapple. Pineapple can be processed into canned pineapple, pineapple juice, etc. What’s more, the by-products of pineapple processing can make sugar, alcohol, monosodium glutamate, citric acid, etc. Pineapple is rich in nutrients and its components include carbohydrates, protein, fat, vitamin A, B1, B2, C, proteolytic enzymes, calcium, phosphorus, iron, organic acids, nicotinic acid and the like. Especially with the highest vitamin C content. The taste of pineapple is sweet and slightly acidic, the character is slight cold. With the effects, pineapple can be used for summer heat, body heat thirst, stomach distention, dyspepsia, difficulty in micturition, dizziness and other symptoms. Besides, in the pineapple juice, there is also an enzyme that is similar to the gastric juice, it can decompose protein to help digestion. The delicious pineapple can not only lose weight, but also have different effects on the health of the body. 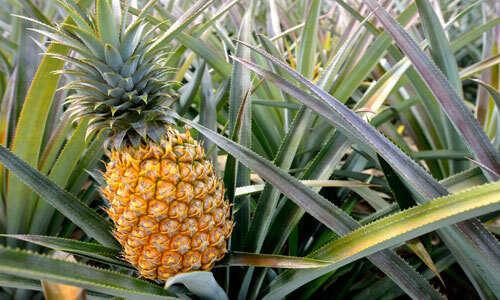 Pineapple cultivars are usually divided into four categories, namely, Smooth cayenne, Queen, Spanish and hybrids. Smooth cayenne: this cultivar is also known as Sarawak, French expedition found it in Cayenne, Guyana, South America. They are widely cultivated, accounting for about 80% of the cultivated area of pineapple in the world. Tall and sturdy plants, leaf margin no thorn or tip a little thorn. Big fruit, the average weight of a pineapple is more than 1100 grams. Cylindrical, flat small fruit. Shallow fruit eye, short and wide bracts. Light yellow flesh, juicy, moderate sweet and sour. Soluble solid content is 14%~16%, high content can up to 20% or more. Acid content is 0.5%~0.6%. Smooth cayenne pineapple is the main variety of canning. Queen: the oldest cultivated variety. There are more than 400 years of cultivation history, Queen is one of the main cultivated varieties in South Africa, Vietnam and China. Medium-sized plants, the leaf is shorter than Smooth cayenne’s, leaf margin has thorns. A cylindrical or conical fruit, the average weight of a pineapple is 400~1500 grams. Small fruit conical protrusions, fruit eyes deep, bracts tip is more than small fruit. Flesh is yellow to dark yellow, succulent crisp, juicy and sweet, high sugar content, rich flavor, the main is fresh food. Spanish: the plant is larger, the leaf is softer, the color is yellow-green, leaf edge with red thorn, but also non-thorn varieties. Medium-sized fruit, the average weight of a pineapple is 500~1000 grams. Small fruit large and flat, the central bulge or depression. Deep fruit, orange flesh, rich aroma, fiber, for canning and fruit juice. Hybrids: it is through the means of sexual hybrids and other means to cultivate breeding hybrids. Plant is tall and upright, leaf margin has thorn, flower is lavender, fruit shape is not correct, fruit weight 1200~1500 grams. Yellow flesh, crisp texture, less fiber, sweet and delicious. Soluble solids is 11% to 15%, acid content of 0.3% to 0.6%. Hybrids pineapple can fresh-eat and process can.